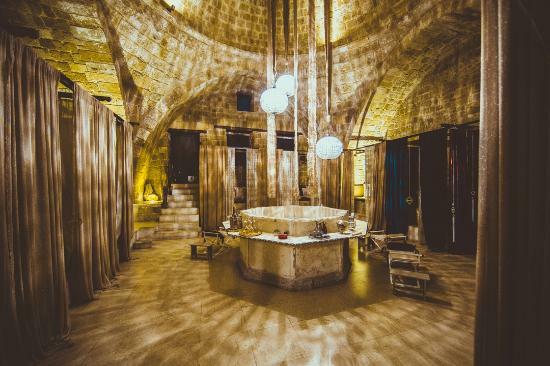 Hamam Omerye, in the Old City of Nicosia, is a Turkish bath originally built in 1570. Its architecture is stunning with a luxurious Ottoman-inspired design. Facilities include a hot and cold room, as well as a range of massages, body scrubs and treatments. Located on the western tip of the Akamas Peninsula, this impressive gorge is approximately 18 kilometres from Paphos and is one of the few accessible gorges in Cyprus. The trail leading through the gorge is roughly 2½ kilometres long with sheer rocks on both sides reaching up to 260 feet in height, the narrowest point being 10 feet wide. Fikardou village is located 40 kilometres southwest of Lefkosia, on the eastern slopes of the Troodos mountain range. The village was declared an Ancient Monument in 1978 by the department of antiquities, and won the Europa Nostra award in 1987. Now almost deserted, the village has been carefully restored to preserve the 18th century houses and two have been turned into museums. This Unesco World Heritage Site consists of an area of well-preserved underground tombs and chambers used by residents of Nea Pafos during the Hellenistic and Roman periods, from the 3rd century BC to the 3rd century AD. Located 2km north of Kato Pafos, the tombs are unique in Cyprus, being heavily influenced by ancient Egyptian tradition. The mosaic floors of these Roman villas dating from the 3rd to the 5th centuries A.D. are considered among the finest in the eastern Mediterranean. Depicting mainly scenes from Greek mythology they were discovered accidentally in 1962 by a farmer ploughing his field. There are over 50 wineries around the island and many of them are in beautiful locations with mountain or sea views, making for a beautiful and interesting day out. Not to mention the opportunity to taste some delicious wine and maybe even purchase a few bottles to take home. The remains of the Sanctuary of Aphrodite date back to the 12th century BC. In the ancient Greek world, Palea Paphos was one of the most important pilgrimage centres of the ancient world due to this famous Sanctuary of Aphrodite, the goddess of love and fertility. Troodos is the largest mountain range in Cyprus and the Troodos National Forest Park covers an area of 9,147 hectares around Mount Olympus. The highest point is Chionistra (1,952 m) and the lowest is Moni forest (700m). It is an area of great natural beauty, suitable for activities such as hiking, winter skiing, biking, nature study, camping and picnics. Built in the 13th century on the site of an earlier Byzantine castle near the town’s old harbour, Limassol Castle is located at the west end of the sea-front behind the old port, within the old town of Limassol. The Cyprus Medieval Museum is housed in the castle with exhibits that include medieval pottery, tombstones, superb silver Byzantine era plates, weapons, crosses and coins. Coral Bay Beach is in the bustling coastal resort of Coral Bay. With soft, golden sand and plenty of loungers and parasols you can make yourself comfortable for the day but there are also traditional tavernas and lively bars close by if you fancy a drink or a bite to eat. There are also plenty of watersports available.